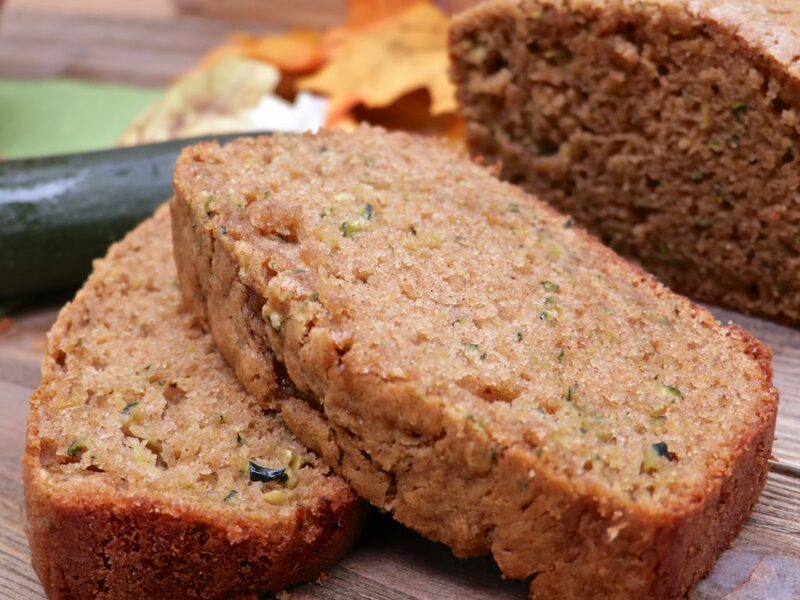 Watch me make this zucchini bread from start to finish! I was in such a blah mood in my last post due to my sucky weekend, but what a difference a week makes! We are still adjusting to not having our sweet Cookie in our world but we’ve done a lot of things to remember her by. The boys decorated a burial box and went on a nature hunt to collect pretty flowers to line it with. We buried her in a special place in our yard complete with a beautiful prayer, homemade memory stone, and paw print balloon release. I’m a firm believer that the more kids talk about a tragic/sad event the better. Talking about Cookie and doing things in her memory has really helped the boys (all of us) embrace the finality of it and celebrate the good memories. We had to cram all this into a couple of days because this weather has been crazy rainy and very Autumn-ish! Like..is really summer and am I really in North Carolina right now!?! I’m not complaining though because we’ve been using this cozy rainy weather to bake up a storm! Ha! Get it? RAINY…baking up a STORM! Ok sorry. Anyway, do you like baking on rainy days as much as I do? There is just something about it right! My garden is thriving right now (TOOT TOOOOT!! yep that’s my bragging horn!) so I’ve been baking zucchini bread out the wazoo! Gosh, I love zucchini bread!! It’s so quick and easy to throw together or make in big batches to give away. Pair it up with some creamy coffee or steaming herbal tea and it’s the best little rainy day treat! And LORDT have mercy look at that texture? I think my little Ethan could live off of homemade zucchini bread! He woke up every morning asking for “bikini bread”. Of course, I had to act like I didn’t hear him just so he’d keep saying it again LOL so cute! This “bikini bread” is a combination of two recipes I have here on this site. My old zucchini bread recipe and my new banana bread recipe. There were several things that I loved about both of them so why not let them hook up! 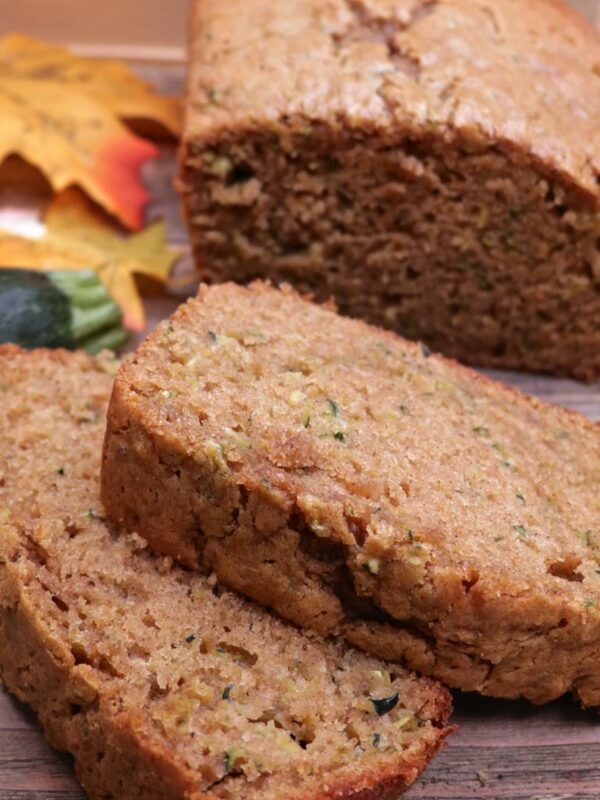 I adore this homemade zucchini bread recipe! Not that the older one wasn’t/isn’t the bomb because it is but sometimes…you just want a different texture. 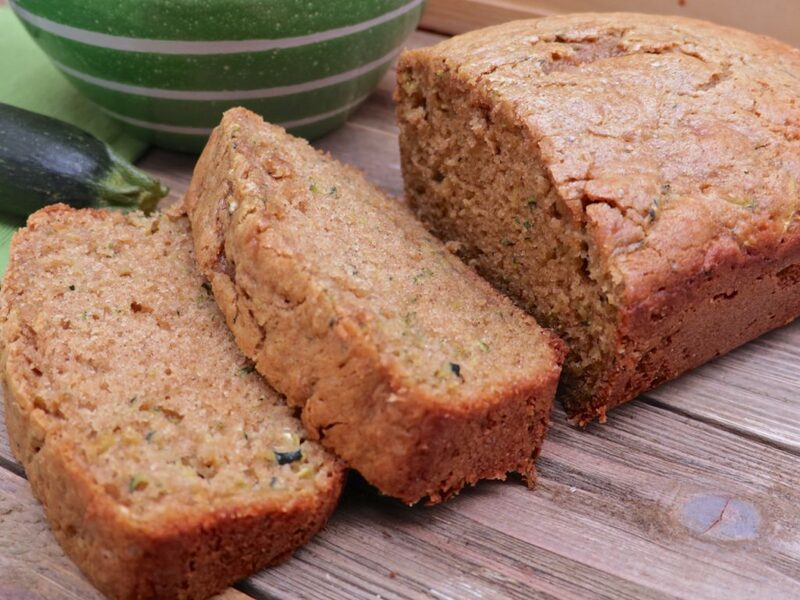 This zucchini bread is so fluffy and flavorful. The crumb texture is a bit looser and lighter, but it still passes the stick to the back of the fork test. And yes ma’am it’s loaded with zucchini!! A whopping 1 1/2 cups full for 1 loaf. That’s usually what I put in 2 loaves but this time I was really wanting a bit of the zucchini flavor to shine, know what I’m saying? Throw this baby in the oven and sit back as the warm, baked cinnamon aromas fill the room! It’s heavenly yall. Don’t overmix. 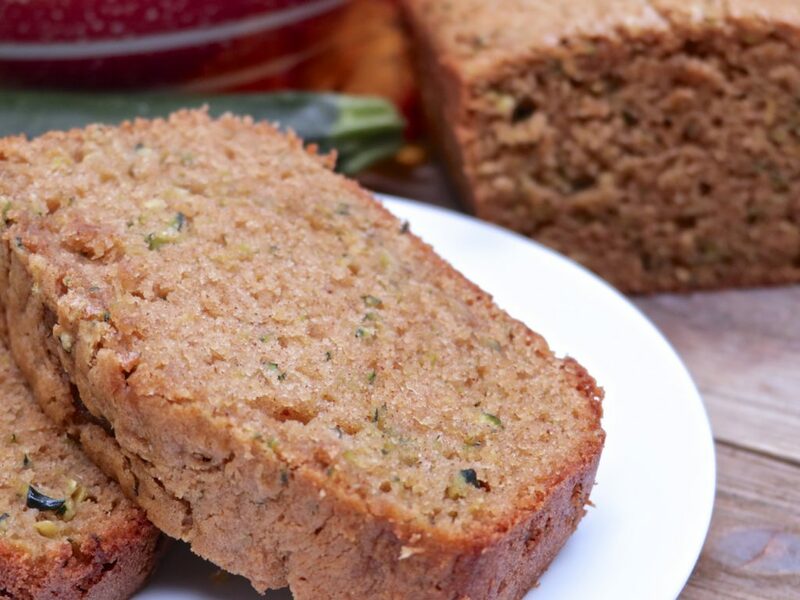 Zucchini bread is a quick bread so be very gentle once you add the flour. If using a mixer make sure it’s on low and mix ONLY to incorporate the flour and then stop. I mean it. To squeeze the grated zucchini or not to squeeze? YOU DECIDE! If your zucchini is super, duper dripping wet after grating, then give it a squeeze to remove the excess juices. I hardly ever squeeze them out though and I love using the finely shredded side of the grater. Keep an eye on it while baking. I’ve made this bread 4 times total. The first time took 50 minutes, the second time took 55 minutes, and the last 2 times took 60. I don’t know what the heck is up with that. Maybe it has something to do with the amount of moisture in the zucchini. I just always check it at the 50-minute mark and then judge from there. When it’s done moist crumbs will cling to the toothpick and the top center won’t jiggle. Remove it from the oven and let it cool in the pan on a cooling rack until the pan is warm. Then remove it from the pan to finish cooling. The bread will continue to cook as it’s cooling so you don’t want it totally done when you remove it from the oven or it will be dry once it’s all said and done. Don’t forget to brush the top with melted butter!!! Yum! Preheat oven t 325 F.
Grease and flour a glass loaf pan. Set aside. In a large a bowl cream together butter and sugars. Mix in eggs and vanilla extract. Set aside. In a medium-size bowl, sift flour, baking soda, baking powder, salt, cinnamon, nutmeg, ginger and clove. Stir gently and JUST until flour is well combined. Remove from pan and let finish cooling on cooling rack. Tip 1. Don't overmix. Zucchini bread is a quick bread so be very gentle once you add the flour. If using a mixer make sure it's on low and mix ONLY to incorporate the flour and then stop. I mean it. Tip 2. To squeeze the grated zucchini or not to squeeze? YOU DECIDE! If your zucchini is super, duper dripping wet after grating, then give it a squeeze to remove the excess juices. I hardly ever squeeze them out though and I love using the finely shredded side of the grater. Tip 3. Keep an eye on it while baking. I've made this bread 4 times total. The first time took 50 minutes, the second time took 55 minutes, and the last 2 times took 60. I don't know what the heck is up with that. Maybe it has something to do with the amount of moisture in the zucchini. I just always check it at the 50-minute mark and then judge from there. When it's done moist crumbs will cling to the toothpick and the top center won't jiggle. Remove it from the oven and let it cool in the pan on a cooling rack until the pan is warm. Then remove it from the pan to finish cooling. The bread will continue to cook as it's cooling so you don't want it totally done when you remove it from the oven or it will be dry once it's all said and done.